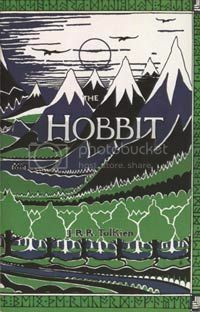 Continuing the books-recently-turned-into-movies trend, February 2013's OBC book is The Hobbit by JRR Tolkien. Here's the thread to discuss as you read (opening Feb 1st). Discuss what you liked, what you didn't like, and if you have seen the recent film version, what you think worked and didn't work in translation. The Hobbit is considered a children's book, so we don't need to worry about any rating concerns this month. OBC are introducing a points system very soon (more word on that in the coming days, and yes it will be backdated to account for January's book, too), so if you are keen on earning some guild points head out and find a copy of this classic novel and join in the discussion. Happy reading! That's fine - I'm sure you can still take part in the discussion, with it being fresh in your mind - no point in re-reading it so soon. Remember if you have any suggestions for future books to send them in. I only read this back in December, so it is certainly quite fresh in my mind. Though I have read LoTR since then! As a curiosity, just how does the bookclub work, I've never really understood. Do people just talk about the book here, or is there another specific place? I'm not quite sure, and I haven't taken much notice of it previously. Just chat about the book here, Daniel. Unless something has changed recently. And yeap, as Sionainn said, this is the thread to discuss. Just started it a little early so people could go out and find the book in time. And, wow, I'd forgotten how "young" the tone of the book is! Just reading the opening paragraphs I was really reminded that this book was written with a much younger audience in mind. The first sentence of The Hobbit is one of the best opening lines to a novel ever imo! I've tried reading The Hobbit, and I just...can't. Something about Tolkien's writing frustrates me, it was the same when I tried to read LotR. In most cases (and like most people) I prefer book over movie adaption, but not in the case of The Hobbit (or LotR). The film takes out all of the superfluous detail and condenses it into a flowing adventure, creating an engaging story. My partner has listened to The Hobbit - the audiobook, and he loved it. He has both read and listened to it in the past and says The Hobbit is a story that needs to be read to you, not a story you should read for yourself. I really like that thought - it makes the story more like a thing of legends, being (vocally) passed down to each generation. I had a real struggle at the start, and just kept finding other things to do instead of read.....then I took it with me on the plane, and I finished it, and started another book on my flight! I could remember a fair bit of the plot, but there was a lot I just didn't remember. Also, I kept expecting characters to die from, like the very beginning, so I think Song of Ice and Fire has truly ruined all high fantasy for me - in that everything else seemd so tame! Still, I'm glad I re-read it. I have it the same way with LotR, Min - think the films are better (particularly the extended DVD versions), and that doesn't happen very often! It's not so much the details. I may enjoy rich description in some books, if what is described interest me. And the world Tolkien built is so interesting that I loved the detailed descriptions of it! It's more the endless praise of the glory of war and duty, and the stern, noble knights etc - particularly in the last two books. But I loved the Hobbit when I first read it, and have re-read it from time to time. Of course, it's more of a children's book than LotR. I read it as an adult, and had to get over that childish tone before I could enjoy it. (Yes, it really does feel like you have your grandfather reading you an exiting bedtime story!) But as soon as I got into the story itself I loved it. Still do. I love how Tolkien took all these well known tropes from fairy tales and legends and shaped them into something of his very own, and made them come real in his version of Middle Earth - which is now a very real place, thanks to him. I remember reading The Hobbit years ago, and I think I struggled through it like it did LoTR. But on my recent re-read I couldn't get enough of them. For me The Hobbit is most definitely 'childish' and not as developed as LoTR, just look at the size. I think it's all a bit of fun really, they skip through a lot of the story, as in they fight for about a sentence, and suddenly they are on to the next place. I much prefer LoTR even though it is so dense, because of the detail. One thing I liked more in The Hobbit was the songs/poems, there aren't as many I don't think as in LoTR (and they were always referring something else that just made you confused). Plus I love Beorn and how Gandalf basically trolls him by introducing the dwarves one by one. I think I like the movie a bit more simply because they have expanded on the book (which is unusual for a film adaptation, but since a lot was just skimming over events in the book they could easily draw it out). Plus you actually get to see the locations and events unfold. I think The Hobbit would be great to be read to you, especially if it was Tolkien himself, I've heard recordings of him reading one of his stories, and they were great, he puts on voices for the characters, and makes it really interesting. As for the tropes of fairy tales and legends, I think Tolkien started it all. He did publish this around World War Two (forget if it was before or after), and before then I don't think fantasy was that well developed. I think if you read Tolkien, you'll definitely notice the tropes, but that's because all the other series have 'copied' them from his work. I know slightly off topic, but I have to disagree, and say that I don't think LoTR glorified war and violence. I don't think that's something Tolkien would ever do, living through both world wars gave him an insight into the horrific nature of violence and war. To me I saw him conveying the true terror of war and the consequences of battle. Obviously not everyone sees it that way, but just because there are a lot of battle sequences, I don't think inherently means Tolkien is glorifying war, I'd like to hear why you think the war was glorified though, it would be a good discussion (even if not directly related to the Hobbit). But I certainly agree that it is a lot clearer in The Hobbit that Tolkien was poking fun at war and violence, and how it is just all about greed, and Bilbo did a fantastic job putting an end to it! I love the dear old hobbit. I'm the sort of person who loves detail, and all I want to do is get into all Tolkien's additional works about Middle Earth, so I can see more about the history/mythology and grand scale of the world Tolkien created, and The Hobbit is the perfect introduction to it all! I agree with Blackbird and Daniel, the simple tone really is quite noticeable! For some silly reason this surprised me, perhaps because I remember the book being perfectly toned for me (but I guess that was on my last read, about 15 years ago in primary school! ), and I was kind of sad that it didn't fit quite so well anymore :( Poor Tolkien must have had a tricky time trying to tone down and simplify the thoughts of that amazing, convoluted brain of his! Oh well, time to grow up and tackle his other works I guess! In regards to the movie adaption, my respect for the movie increased with a re-read. Knowing that the random, fantastic things that happened (mountain giants, wargs battles, etc.) came from Tolkien, and not just from movie makers trying to flesh out enough material for multiple films, strangely made me like the movie all the more! Not sure about the need to bring in Azog the super big-bad-guy-orc though. Perhaps they were trying to give the audience an identifiable bad guy to focus on, rather than just a collective hoard of random orcs/goblins. Kind of reminded me of that very aggressive infected human in I Am Legend, who leads the hoards against Wil Smith. Hmmm I guess it did lead into interesting back story with Moria.... still, I think I prefer it when they keep to the well-loved story :) Did anyone really like the introduction of Azog? Also, can't believe Tolkien explained Gandalf's banishing of the Necromancer in ONE sentence!!!! Kind of important detail to just gloss over! On a different note... I found it very strange to read a book practically devoid of the female race. Does anyone have any insights into why Tolkien wrote so few female roles into the LOTR or the Hobbit? ^Re the lack of females- it is a criticism of Tolkien that often crops up. I'd say it was the era, and the fact that Tolkien was an Oxford professor (read conservative ;) ). He was also best friends with C S Lewis around the time of his writings and Lewis has come under a lot of fire for sexism in Chronicles of Narnia. I truly think it was the era and their status in British society. I mean the books were written in the 1930s/early 40s and women were not seen as involved in 'men's wars' back then. I agree with Neonorne about LOTR- I found it's last two books a real struggle and I feel that the LOTR films smoothed everything into a more coherent story and brought out Tolkien's themes in a stronger way (very rare for book to film adaptations). To me both books are hubris tales which Jackson highlights a lot. He also gives a bigger role to the Arwen/Aragorn story as opposed to Tolkien's throw away sentences which annoyed the heck out of me. I disagree that Tolkien glorified war. He was dead opposed to it given when he wrote most of The Hobbit and LOTR. The whole point of Hobbits is to show sadness for the loss of an era- much like Thomas Hardy did with Tess of the D'Ubervilles a few years earlier. He mourned the loss of pre industrial country life and the rise of the doings of hurting and pride filled men. He is clear that the age of hobbits, dwarves and elves is over by the end of LOTR, but he does not say that this is a good thing. The whole series is permeated with a helpless sadness. The elves know that they are goners but what can they do? It is the age of men for better or for worse. I rather thought that the message was that the evil of Sauron (read the evil spreading across Europe) could not ever be defeated by the angry hubris of warring men. It could only be defeated through the hope and the faith and the actions of the little people- ordinary men and women like you and me. Tolkien was a converted Christian also thanks to Lewis- for him it would be darkest before the dawn so to speak. At the time of LOTR, he had no idea of how the war would end (apparently he would be struck down with despair and be unable to continue writing from how futile resistance to Hitler seemed to be) but his work emphasises the importance of faith in the face of insurmountable odds as well as the now done to death fantasy trope that was none the less original back then, that warring might is never as strong as a little person who is in the right. The Hobbit is a prologue to LOTR and introduces hobbits- hobbits by nature are simple folk but the time will come when, to quote Galadrial in the film, 'the doings of hobbits would change the course of the future." Hobbits are not grand but they are also not subject to greed or to covertness or to subterfuge- at least not naturally. I think that this theme is present in both LOTR and The Hobbit. Both are hubris tales as well as adventure stories. They are both stories of how war changes a person- and not necessarily in successful ways. Frodo pays for his big role in the war because he cannot stay behind to enjoy what he had fought so hard for. That is the price of war. Bilbo can never enjoy Hobbiton in the same way again- his mind was pushed and expanded by his quest. He is less narrow minded now. Less prejudiced. But he has lost some of his simplicity too. Some of his innocence. It was that loss of innocence that I saw Tolkien as mourning in both books even as he celebrated the doings of country folk. He knew that the war was the passing of an age even as it had been necessary. If the Hobbit sounds childish to adult readers it is because it was written for children 8 to 10 years of age. I think Tolkien did an awesome job of writing an epic adventure story that young children could/would read. Not many kids would pick up such a densely written book for leisure reading. I have to admit that I'm more a LotRs fan. The Hobbit is a great book but I never enjoy it as much as LotR or The Silmarilion. I do love the description though. I think Dwermeroflight has a nice point. There is a definite feeling of sadness and ending that permeates the LoTR, and that makes it difficult for me to read. the hobbit is much easier. I love its lighthearted elves and characters in general. I thought the movie adaption was really awful. Azog was distracting, the nastily flippant way the goblin king died - very unTolkien. I found it long and boring, overly serious, and rather like a computer game. The Radagast shed was evidently there for selling merchandise. The appalling scene where Thorin 'rethinks' his opinion of Bilbo, that dialogue piece type is so overused in movies, and never, ever used in real life. Such a long, boring film, so few redeeming features. Bad dialogue, bad screen play in general. I loved the book very much, growing up. My favourite bit was probably the visit to Rivendell (where, according to the film, the elves, famous hunters and archers that they are, eat iceberg lettuce), and the clever map with it's secret codes and writings. I love Tolkien's dialogue - Thrain's departure "a hundred years ago last Thursday" and the way Smaug talks. For some reason, I always really loved the thrush. Why was it so old? why was it able to talk? Why was it helpful? the thing I really love about Middle Earth are all the unresolved mysteries. The big mystery of course is the ring, but there are so many others. I also loved the cranky Beorn, and loved to picture how all his animal friends helped him out in the house, the sheep carrying the table cloth and so on. I've just begun to re-read it, so we'll see if I remember it as it really is.